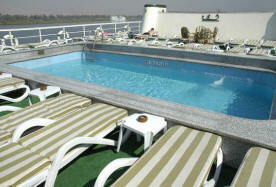 Presidential Nile Cruises owns and operates 6 boats with a capacity ranging from 65 to 75 cabins. All the boats are air-conditioned. The boats are equipped with Fire and Safety systems. They each feature a restaurant serving a buffet breakfast and lunch and a dinner "a-la-carte". The onboard chef can arrange for any special dietary requirement and always caters for vegetarians. Kitchen and its staff are compliant with the strictest health and Safety standards. On the upper deck, guests can enjoy cocktails at the bar which also serves as a venue for various shows and entertainment. Enjoy the Belly Dancing Show and other traditional Egyptian performances or just dance the night away to the latest tracks chosen by our onboard dj. For the sun-lovers, there is a large sundeck with loungers and a swimming pool to relax after a long day of visits under the scorching Egyptian sun. A massage service is also available on the sundeck, to help our guests unwind with spectacular views of the Nile. Other facilities provided are table tennis, laundry service, internet/fax/international phone lines, jewellery and gift shops, massage, 24 hour reception and room service. The MS Symphony was built in 1979. It measures 236 feet in length, and 36 feet wide. 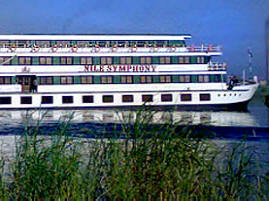 The M/S Nile Symphony has 54 cabins and boasts 6 luxury suites. All cabins are fully air conditioned and equipped with en-suite bathroom, TV, mini-bar, telephone and safety deposit box. The MS Ritz has a capacity of 77 cabins. All cabins are fully air conditioned and equipped with en-suite bathroom, TV, mini-bar, telephone and safety deposit box. 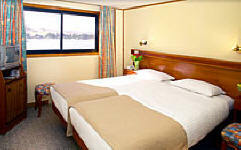 The MS Commodore has a capacity of 77 cabins. All cabins are fully air conditioned and equipped with en-suite bathroom, TV, mini-bar, telephone and safety deposit box. The MS Nile Plaza has 72 cabins All cabins are fully air conditioned and equipped with en-suite bathroom, TV, mini-bar, telephone and safety deposit box. The restaurant and bar seat 140 people.